These three things make up the foundation of who we are. Women might be judged solely on how they look, but men are judged on WHAT THEY DO. What do you do? What do you like to do? What have you already done? What do you plan on doing? Either directly or indirectly, people will ask you these questions and you must have satisfactory answers. If the answer to all these questions is Xbox then you’re doing it wrong. These are activities you do regularly with TANGIBLE results. “Playing videogames” is not a hobby. Neither is watching sports, drinking beers, or hanging out with your bros. There is nothing inherently wrong with these activities, but in the end you haven’t achieved anything substantial. We fault party girls for endlessly pursuing good times without contributing or developing anything. While lounging on the porch lacks the glamour and excitement of club music, it’s ultimately just as frivolous. Hobbies are more analogous to skills, rooted in pragmatism with tangible benefits. It is imperative that you cultivate several hobbies and work on them regularly. That is, at least once a week -- preferably more often -- you dedicate time towards the pursuit of each hobby. How many people do you know that “play guitar” but haven’t touched one in months if not years? If they even still own one. To develop a well-rounded personality, you must pursue at least one hobby from each of the three cardinal spheres: The Physical, The Creative, and The Mental. These are activities that strengthen your body and increase your stamina. At least three times a week you should be engaging in a physical activity. The very minimum requirement is weightlifting, the quintessential “lift more”. But often that’s not enough. Every lame half-alpha out in the gym, and for top-tier guys a weightlifting regimen is all but mandatory. A true physical hobby goes beyond mere maintenance of your physique. These are activities like snowboarding, rock climbing, boxing, and cycling. Even conventional sports like basketball -- if you take it seriously. Pushing your body to its limits and developing your natural agility, power, and grace. We might not be chasing down mammoths any more but you can still be a hunter and warrior. If it is your sole source of exercise then three times a week is mandatory. If it supplements weightlifting or calisthenics, then once a week is acceptable. It’s not just about strengthening your body, but adding another layer to your personality. “I’m hitting the slopes over break. I just ran a marathon last weekend. Let’s ball after work.” You will have a hardness and appeal to you that most people lack. These are activities that result in tangible pieces of aesthetic work. Drawing, painting, music, sculpture, singing, and so on. Most people believe that artistic ability is innate, but really it’s a matter of practice and commitment. Just like lifting and game, there are myriad resources available for you to improve in the media of your choice. As with The Physical, creative hobbies need to be practiced at least three times a week. That isn’t to say that multiple times a week you need to painstakingly hew Greco-Roman deities from living marble. Just as there are light and heavy workouts, there are smaller and larger sessions. For example, I’m a painter. I dedicate a single day during the week in which I go to the studio, turn my phone off, and spend a few hours painting. The rest of the week I just work in my sketchbook: drawing, sketching, and generally brainstorming. Likewise, maybe you only go to a voice coach once a week, but the rest of the time you practice your scales at home. Not every session is monumental, but you consistently make progress. If you can commit to those three weekly sessions, you’ll be surprised at how quickly you improve and how proficient you become. If you spend money on private lessons or take a class at the local college you’ll progress even faster. You don’t need to be a Renaissance artist to satisfy this hobby. Creative writing and poetry are equally excellent. Woodworking is rustic and timeless. Photography and graphic design are also viable options that are more modern and accessible, although significant effort is required to elevate yourself above the many amateurs. Another word for this sphere would be The Technical or The Intellectual. The Physical will strengthen your body and The Creative will refine your aesthetic, but you need to challenge your mind in order to complete the trinity. There are overlaps between Mental hobbies and Interests (which I will mention shortly), but remember that the defining aspect of a hobby is that it provides tangible benefit. While reading about history and playing chess are certainly intellectual pursuits, ultimately you don’t achieve much besides knowing more about history and getting better at chess. Mental hobbies are things such as coding, mechanics, and foreign languages. They can be financial pursuits such as real estate or managing a business. On a more Machiavellian level, it can even include human psychology and manipulation. They all require intelligence, study, and practice, but are useful and applicable. You can build your own website or design a new app. Save hundreds of dollars maintaining your own vehicle. I recommends travel; consider how much more autonomous you will be and how much richer your experience when you have multiple means of communication at your disposal. Out of the three spheres, Mental hobbies most directly translate into utility and profit. These categories are not set in stone. There is plenty of overlap between the spheres. Dance blends the physical and the creative. Cooking and baking blend the creative and mental. Martial arts combine the mental and physical. Even something as mundane as gardening contains elements from all three areas. The key is to become a well-rounded individual who can contribute in multiple ways. Interests and hobbies are often confused. While there are similarities, the main difference is that interests are pursued on their own merit. You engage in them solely because of their appeal to you. Hobbies are constrained through their practical application, but interests are far more open ended. However, most interests have zero practicality; you need a different mindset when you pursue interests versus hobbies. The "point" of having diverse interests is allowing you to contribute to conversations. That’s it. Yes you can pull the sitcom routine and try to memorize various trivia on a subject so you can fake expertise, but your conversations will be far more natural, organic, and fulfilling if you have real knowledge of whatever topic you are discussing. To be an interesting person you need to discuss interesting things; to discuss interesting things you need to have knowledge on interesting things. What do you do for fun? What interests or excites you? Answering these questions is crucial to determining what you want to pursue. Nature and the outdoors. Punk rock. Floral arrangement. Archaeology. Tarot readings. Classic literature. Tropical fish. Horror movies. Modern art. Taxidermy. Deep house. American history. Board games. Tantric philosophy. Magic tricks. Rock collecting. German expressionism. Astronomy. Hog futures. Interior design. Your options are endless. This is such a simple and basic concept but many people lack the basic desire to broaden their horizons. Ask your plates about any of these topics and watch their eyes glaze over. Take initiative and pursue your interests actively. You can’t passively sit through life waiting for opportunities to explore. Just like anything else on, read, learn, and spend time on them. If you don’t know where to begin, don’t forget that any of the hobbies mentioned in the previous section are automatic interests. They naturally lend themselves to other areas of knowledge. If you’re a cyclist, then you already know about cycling. You can discuss different bikes, routes, and maintenance, but it’s so easy to expand from cycling into environmental impact, public transit, kinesiology, health benefits, city planning, triathlons, and mechanics. However, not all interests are created equal. Videogames are a legitimate interest. You can spend time and money on them, you can discuss them, and they bring enjoyment to your life. For practical purposes, NO women want to hear you talk about videogames. None of them. Ever. What you do on your own time is your business. If they help you unwind, God bless. But understand that certain things have a negative connotation that you may want to distance yourself from. If your primary goal is love strategy, it is imperative you keep that in mind. Regardless of how lame your interests are, they should all contribute to your overall frame of reference. Think of “water cooler talk”. Even if videogames aren’t hot, you can still connect with people who play them. The key here is to not separate and categorize hobbies and interests, but to pursue them in concert and combine them in interesting ways. For example, if your physical hobby is rock climbing and one of your interests is nature and the outdoors, then every month you go camping with all your gear and climb during the day while sleeping under the stars at night. Doing that is much more interesting than simply going to an indoor climbing gym and walking through the woods behind your house. You create something greater than the sum of its individual parts. These kinds of combinations lead into the third aspect of personality. It's very easy to fall into a routine of work-gym-eat-sleep-repeat. You sustain yourself – even stay healthy - but are you really living? Even if you pursue all the hobbies and interests mentioned earlier, you could still spend your entire life in a 10-mile bubble. You need to go out and experience LIFE. 9 times out of 10, if a newbie isn’t making any progress it’s because he’s spending too much time reading and not enough time doing. Climb a mountain. Tag a watertower. Party in Ibiza. Get in a fight. Sneak backstage at a concert. Go skydiving. Volunteer at the shelter. Backpack across Asia. Wrestle a large animal. Go to Gay Pride. Learn to backflip. Spend a night on the streets. Take two dates to the same party. Run with the bulls. Hike the Pacific Crest Trail. Go streaking. Note that some of these activities are HORRENDOUSLY stupid. But that’s the great thing about experiences, they are EXPERIENCE. And even the bad ones make you a stronger, more interesting person. Internalize the good. Learn from the bad. This is part of the reason why girls love bikers. They’re doing stuff. They’re exciting. They’re dangerous. Even if in the grand scheme of things these guys are in a s@hitty position, girls would rather have fun in the dirt than stay clean and bored on the couch. Girls would rather share an Alpha than own a Beta. If you never venture out of your comfort zone, you will never grow and develop as a human being. However, it’s not about running around like a headless chicken trying to do as much wacky things as possible. Yes, in the grand scheme you can travel all around the world collecting notches and accolades, but in the mundane, day-to-day aspect you also need to maintain an active social life. One of the more common questions I see from new subscribers is how to meet girls once they graduate college. These guys have trouble because they don’t make an effort. 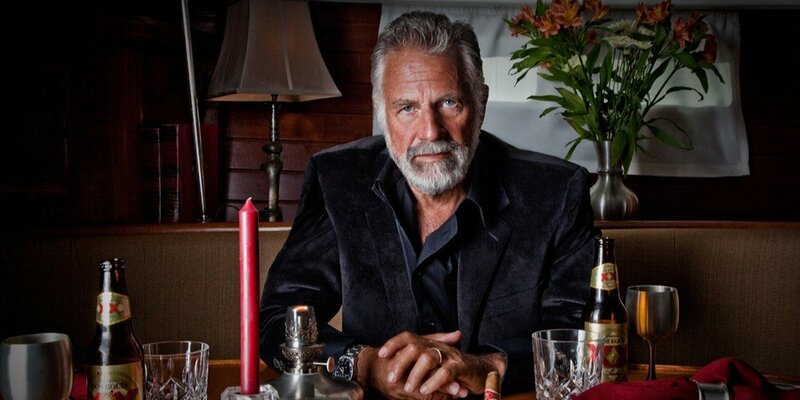 You can be The Most Interesting Man in the World, but you still need to put yourself out there. Many men enter "accidental monk mode". I've been guilty of it myself. You read the literature, you hit the gym, get your career on track, and focus on your hobbies. But since a social life isn't spoon fed to you like it was in high school or college you never go out unless someone drags you. Sometimes it's because your social network is in shambles, sometimes it's because videogames are convenient and available. Before you know it a month goes by and you're in a dry spell. If you want a social life you have to WORK for it. Guys complain about never meeting girls, but if they were going to house parties, concerts, doing co-ed athletics, hitting the bars, perfecting their online game, and just generally expanding their social circle, you'd hear a lot less complaining. But that's hard. It's a lot easier to make excuses.